The 1.8 engine was turbo charged and used by peugeot in rallying. Are you sure they have got their facts straight? New heater matrix came yesterday. £32.39 from euro car parts. Now to start putting the dash back in. As for the engine and management side of life i may just leave it for a while till i can make a definate decision on what to do. Still kind of like the Pulsar GTIR engine option, its a strong unit with the potential for big power, i can get a complete engine, ecu and loom for £700. Still got loads to do to the shell in the meantime. 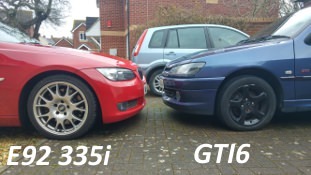 The 200sx is mounted inline, the Pulsar GTI-R is transverse, according to my nissan mate guru couple that with a sunny gearbox as the GTI-R box is 4wd and it is a good set up. Obviously lots of custom bits would have to be made, but i dont think it will cost 5K. Most of the mechanical stuff i can handle. mating the Nissan and Peugeot wiring looms could be a mission though. Such a shame G Tech Motorsport are not about anymore. Also had a play at mating up the Xu7 block with the Gti-6 Head, my mate popped up to take some measurements to see if he can fabricate a turbo manifold from the GTI-6 one. Started to prep the LH side of the engine bay today. Ok, Engine bay is all done now. Recieved the big end bearings and main bearings today, collecting the thrust washers from Peugeot tomorrow. Waiting for a clutch kit, once that arrives, sending the bottom end off to connaught engineering to have it blueprinted. Having gearbox dramas at the mo as you can see on my other thred. Waiting for the supplier to get back to me. Basically my gearbox came with the reverse cable cut off and no gear lever lift. Love this project. Got any more pics dude? (09-01-2014, 08:25 AM)Grant Wrote: Love this project. Got any more pics dude? Got quite a few to upload, will do them soon. On a good note while the engine is being bluprinted he has looked at the pistons and reackons that he can safely machine 4 thou out of the crown to lower the compression and as long as i dont run anymore than 1 bar of boost the bluprinted internals will take a turbo all day long. I wanted a turbo from the start, the biggest drama will be fitting a turbo, there has to be a way of doing it without spending £1800 on a DP set up. This has so much potential to be an epic car. Well more epic than it already is turning out to be. The main bulk of the surface rust was around the ABS pump area. but its all sorted now. As i am going to go down the turbo route, i have decided to use the GTI-6 engine, got the main bearing shells in today, although the thrust washers do not look the same as the ones that came out, but the Peugeot dealer assures me they will be fine. I am really looking forward to taking it to some events once its finished. Looking at the prices of everything both options with me doing all the work come out almost the same, both around the 4k mark(That's just in Parts) if i use off the shelf components. Chuck the emerald at £700 plus mapping its going to be around the 5k mark. Once i get the head and block back together and in the car, i can start playing around at fabricating a exhaust manifold. Supercharging can be so much cheaper than 4k but if I had the choice, I'd go down the turbo route. Much more fun! Check end float when you get the crank back in. Most miss that and can be quite bad sometimes! (10-01-2014, 09:00 PM)Niall Wrote: Supercharging can be so much cheaper than 4k but if I had the choice, I'd go down the turbo route. Much more fun! Do you have the tolerances anywhere, i only have the ones that are in the haynes toilet paper. Not sure if they would be the same as the standard 2.0 16v. There was me thinking i would get the crank back in today, like feck !!!!!!!!. Said professional motor factors have sent oversized main bearings. Checked the big end barings too, same detail. Spoke to pugeot, each main bearing costs £10 + vat. More pics of putting the crank back in.